My friend Courtney brought some of these over to us a week or so ago . . . and my husband and I seriously devoured them in a matter of minutes. I found the recipe (thank goodness for the internet!) and made them again and as you can see from the picture, there was only one left to take a picture of. 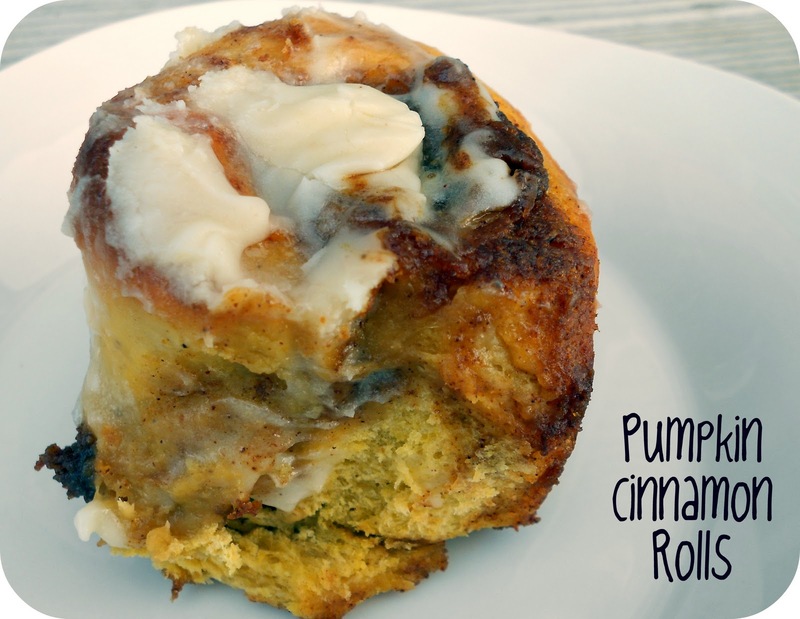 I love cinnamon rolls, but these are absolutely divine! They just melt in your mouth . . . they are so good. 1. Combine warm water, yeast, and teaspoon of sugar in small bowl. Stir until yeast is dissolved. Let stand until froth doubles. 2. In mixer fitted with dough hook, combine milk, eggs, pumpkin, margarine, the 1/2 c. sugar, nutmeg, salt, and cloves. Mix until smooth (don’t have a mixer? You can still make these. I first used a wooden spoon until it got to be too hard and then I started using my hands. You have to knead it for a while to get that smooth consistency, but it can be done!). 3. Add 4 cups flour to mixing bowl. Pour frothed yeast mixture on top of flour. Knead about 5 minutes, adding flour 1/2 c. at a time until dough barely begins to clean the sides of the mixing bowl. Dough should be smooth and moist, but not sticky. 4. Spray a bowl with non-stick cooking spray. Place dough in greased bowl. Cover with wet towel, or plastic wrap sprayed with non-stick cooking spray. Allow to raise until doubled, about 1 hour. 5. While dough is raising, prepare filling. Place room temperature butter and pumpkin puree in small bowl. Using electric mixer, beat until mixture is smooth. In another small bowl combine brown sugar and cinnamon, set both bowls aside. 6. Pour dough out on slightly floured surface. Roll into a rectangle 16×21 inches, dough should be about 1/4 inch thick. Spread the pumpkin/butter mixture over rectangle. Next, evenly spread the sugar/cinnamon mixture on top, slightly pressing it into the dough. 7. Roll up long side of dough, forming long tube. Cut tube with sharp knife about every 2 inches, making 12 rolls. Place rolls in lightly greased 9×13 baking pan. Cover and let rise until nearly doubled, about 30 minutes. 9. Bake rolls in oven until golden brown, about 15-20 minutes. While rolls are baking, beat together cream cheese, butter, powdered sugar, and vanilla extract to make frosting. Spread frosting on warm rolls before serving. This look so stinking good! Need to try them right now! Pinning! Thanks for sharing! Finally someone who gives the right amount of cinnamon needed for a good tasting recipe thank you! These look terific. Saw it, made it, ate it. Going for another! I made my dough in the bread maker, since I forgot the pumpkin till after I added the flour, I put it in the corner on top of the flour, so I needed to help the mixing a bit in the beginning. The recipe made a lot of dough, so I split it in half and made two logs, raised the rolls for 45 minutes, and made 20 large delish rolls. Thanks for posting! i have found that if i put a boiling pot of water in the oven(oven is off of course) that i can put my dough in the oven un covered it stays nice and moist and it rises wonderfully. I think that you could totally make these ahead of time and freeze them! I would probably go all the way to step 7 and then freeze them before doubling . . . then pull them out and let them rise before you want to cook them. Or you could totally cook them and then freeze them (I just worry about them getting soggy when you thaw them out). I am so sorry- I have never froze them like this, but I think that it will work. Good luck!!! And happy Thanksgiving! Just made them and they are DELISH! I let the first rise go longer because I had to take my kids roller skating, and I think I should have baked them a tad bit longer (they were a bit doughy in some spots) but they came out fabulously! Recipe says add 4 cups to bowl and yeast mixture on top of that. ... but then says add flour 1/2 cup at a time. Where is the pumpkin part of the rolls? Sorry to be dense here! I don't want to mess up! If you go down to #6 in the directions it says: Pour dough out on slightly floured surface. Roll into a rectangle 16x21 inches, dough should be about 1/4 inch thick. Spread the pumpkin/butter mixture over rectangle. Next, evenly spread the sugar/cinnamon mixture on top, slightly pressing it into the dough. So the pumpkin part of the recipe is spread over the rolled out dough. OMG. I tried this recipe, adjusting for the high altitude in which I live, and they are absolutely amazing. I have been looking for a pumpkin cinnamon roll recipe that had a good amount of pumpkin. I chose this one because it also had pumpkin in the filling. This recipe is definitely a keeper. I am in heaven. Seriously.